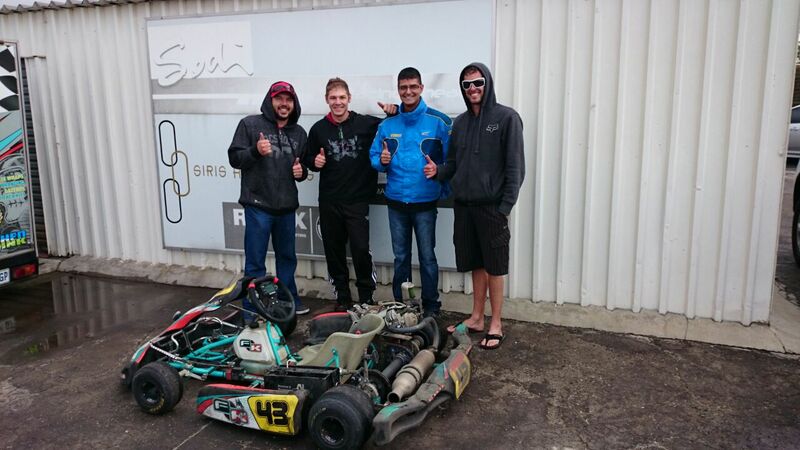 Home > Race Report > Team Southbank #43 victorious in gruelling 12 hour charity kart race. Team Southbank #43 victorious in gruelling 12 hour charity kart race. The 7th Wide Horizon 12 Hour Charity Kart race, doubling as Round 9 of the Prokart Endurance Series has come and gone. There were quite a number of drivers looking pretty “gone” at prize giving. 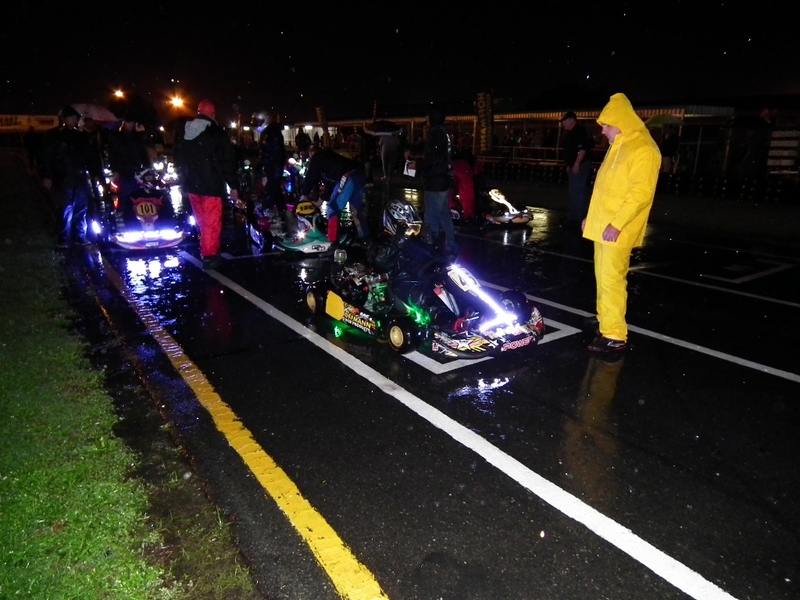 This the most challenging of kart races, was made even more so, because the rain Gods were in attendance with a vengeance. It has become something of a tradition, over the years, for the 12 hour to signal the start of the rainy season in Gauteng. This year was no exception with constant rain falling from about 19h00 until 04h30 in the morning. So, not only the most rain ever, but also, the slowest average speed ever, the least number of laps ever, but some of the most fun ever. The build up to the race on the day saw teams kitting out their pits for the long haul. Caravans, tents, boom boxes and all manner of keep awake aids were being unpacked. Fortunately, no one left their karts behind. There was lot of last minute preparation going mostly focussed on getting the lighting systems on the karts working. Some teams like Containerforce had to focus on more important things like changing the axle, after discovering with about 45 minutes to free practice, it was bent. This was achieved with the help of many in about 35 minutes. Qualifying brought back memories of some of our old CoC, Henry Schultz, crazy qualifiers for the 12 hour, which have become something of a tradition and legend. 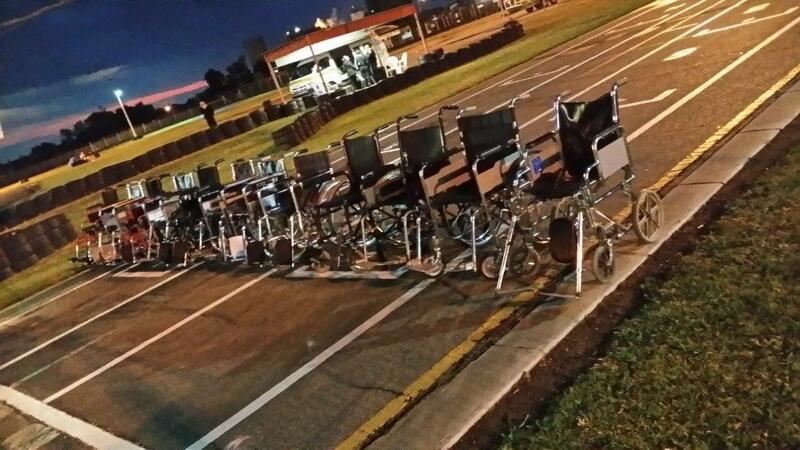 This year teams were presented with a wheelchair race to determine the qualifying order. Two heats lined up on the grid. There was a patient and a pusher. At the halfway point the patient had to make a miracle recovery and become the pusher, and the pusher had to suddenly become incapacitated, and need a wheelchair. In quite a few cases the pusher’s incapacity was genuine, after pushing the patient for about 100 metres. The chariots lined up and ready to go. Who qualified fastest??? Who cares, although it is said a protest was lodged to investigate some skulduggery on behalf of Team Screwloose. Mind you with a name like “screwloose” one should probably expect something a little out of the ordinary. Conditions were wet before the start and they didn’t change much after the start. The race started promptly at 20h30, with the now traditional Le Mans start, although there was more than a little confusion when CoC Robert decided to start the race without the usual one siting lap. He was more worried about getting wet, after his rain jacket went missing. This meant there were more than the usual number of people on the grid when the flag fell and we barely managed to get everyone behind the safety fence before the leaders completed the first lap. Amazingly, despite the wet, and I mean wet, conditions there were only two spinners in the chicane and no contact which could have meant someone’s race cut short. Team Motul Honda #5 were left stranded on the grid with an apparent fuel starvation problem, although the fuel tank was full. After manhandling the kart back to the pits it was discovered the individual tasked with securing the battery pack powering the lights, had managed to “strangle” the fuel supply line with the additional “security” cable ties. That sorted, they set out to reel in the rest of the field. Unfortunately, after fighting back to 15th place, their race was run after 79 laps when the kart limped back into the pits with a very bent chassis. BP Apex #55 were also having there share of fuel problems. In and out of the pits in the early stages of race, clearing the carburettor of water. This lead to a more serious problem with water in the oil, ingested through the carb apparently, and a seized engine. An engine change should have solved the problem, but it re-occurred, and rather than risk another engine they retired from the race after 80 laps. Team Titan #90 also had a shortlived race when there kart returned to the pits with the driver complaining “it won’t turn left” Since there are more right handers than left handers on the Vkart Circuit, most observers couldn’t really understand what the big fuss was about. After some help from fellow competitors, involving various size hammers and levers, theywere sent out to “drive around the problem”. This lasted for the trip back to the pit exit, after which they returned, unable to negotiate the 180⁰ turn to get back onto the track. Further inspection revealed the ‘C’ section mounting for the stub axle had cracked. Resourceful as ever the 4 Stroke Workshop Support team were called into action. An attempt at welding the crack was unsuccessful and Team titan were out after completing only 19 laps. Team Logan #35 were having a strong run, having qualified quite well. Their start was really good, but that is probably down to the fact that Darren has spent the last six months in Mali and Dakar, where he has been practicing short sprints to catch chickens for dinner. Up to 2nd place in the early stages of the race, the also fell “fowl” (sic) of the water in the engine syndrome (wites) and had to pit several times and ultimately had to change the engine, after which they fought back to finish 7th. Team GTR #11 were another team putting I string run early on in the race before being beset with “wites” (see it is not only the car manufacturers that can come up with stupid acronyms), but fortunately they realized what the problem was, before any terminal damage had been caused. An change of engine oil, a “boer maak a plan” bit of engineering to manufacture and air cleaner box out of an empty 2 liter plastic bottle, and problem solved permanently. In the early hours of the morning, Peaceful Paul returned to pits covered in mud and grass from an off circuit excursion, complaining of “not turning left”. This was later found to be the steering column that was anything but straight. Having replaced the column they were able to continue and finished 11th. Team Kart Shoppe #23 piloted by recently crowned SA National Rally Champion, Leeroy Poulter, congratulations by the way, were off like a torpedo, was going say a “scalded cat” but clearly conditions were more appropriate to torpedo’s. Showing himself to be quite at home in the conditions, and clearly not needing any advice from Elvéne on which way the track went, he was wracking up a lead at an alarming rate, due to lapping at about 3 seconds a lap faster than the nearest competitor. Unfortunately, they ran into trouble with a sheared axle, when they were about 8 laps ahead of 2nd placed Southbank #43, which cost them 35 minutes in the pits. This dropped them down the order. After replacing the axle they fought back to an admirable 19 laps down on on 1st place. Hoffmann Racing #29 were also fast out the blocks and were running in the top 6 early on. Later in the race the pitted to change the oil to combat the dreaded “wites” which dropped them down the order a bit. Still later they ran into brake issues when the brake rod, connecting the pedal to the master cylinder pistons broke. They managed to continue with the back up brake cable performing the function of the brake rod. This probably cost them some lap time, but they nevertheless finished in 3rd place, 2 laps down on Containerforce #13. Team Dask #14 showed some good pace early on and were largely unobtrusive, quietly going about their business, with no reported issues we know about, to finish 8th. Newcomers, Red Line racing #66 also fell prey to the dreaded “wites” after completing 117 laps, and the Jokers #45 fell by the wayside after 384 laps. Kartinator #19 were running strongly at the start and at one time were running in 8th place. Unfortunatley they also ran into some problems which saw them finishing 18th, behind Half tonne #27. Other newcomers Ghost Karting #54 and Martini Racing #100 must have wondered what they had let themselves in for, but soldiered on to finish the most daunting of challenges first time out. Welcome to the series guys!!! Sabertek # 16 took a creditable 5th place having saved their energy for the big one by missing the preceding four rounds to prepare their kart for the BIG ONE. Just goes to show the adage of preparation,preparation, preparation really works!! They were followed home by Team SPH # 46 who had a steady consistent race without any problems we know of. 2P Racing #63 were in contention to start with, but the call of the “hubbly” in the pits must have distracted them a little, but they nevertheless finished 9th followed home by Xtra Shoes and Clothing. Perhaps they should have checked out the weather forecast, ‘cos they could have cashed in and made a fortune selling “extra shoes and clothing” (get it?) to the teams, all of whom would have welcomed some dry extra shoes and clothing. 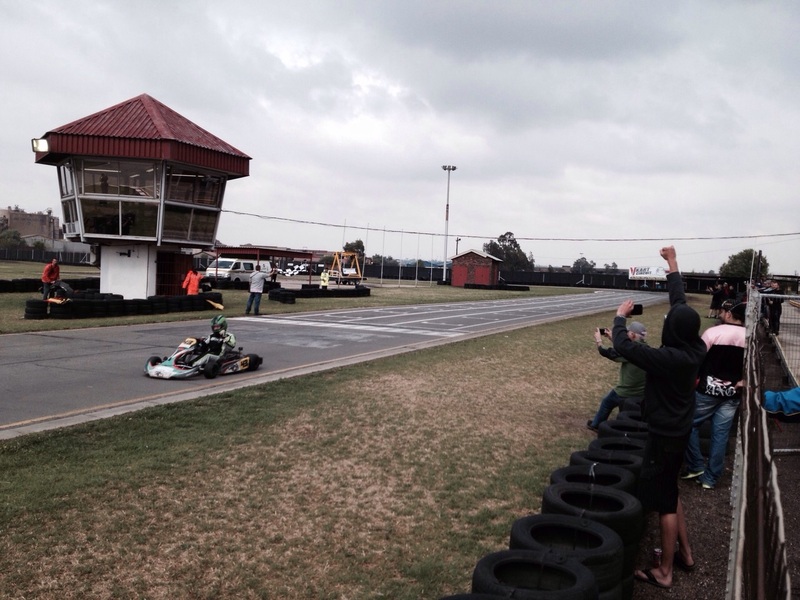 Karting 101 #101, that’s not a typo, recorded their best result by finishing the race in 12th place. Even if they hadn’t they were going to have party anyway. What with caravans, sound system and flat screen TV, they were lucky they didn’t miss the start. Shake and Bake #98 had their fair share of problems throughout the race and it to their credit they still there at the end. Well done guys. Containerforce #13, despite the pre practice shenanigans ran strongly throughout the race and were in position to pick up the pieces when some of the leading contenders ran into trouble. Early in the second driver session, the sprocket key came adrift, maybe because there were too many mechanics helping with the earlier axle change and no one doing the spanner check after, so a quick repair, and thanks again to the 4 Stroke Workshop for coming to the rescue with the correct key, got them on their way again. When the “wites” became a recurring problem a precautionary long driver change pit stop was taken to check they hadn’t been afflicted with “wites”, and on their way again without losing position. After that a consistent run saw them claim second position. And so, to the victors the spoils!! Southbank #43, what can we say? 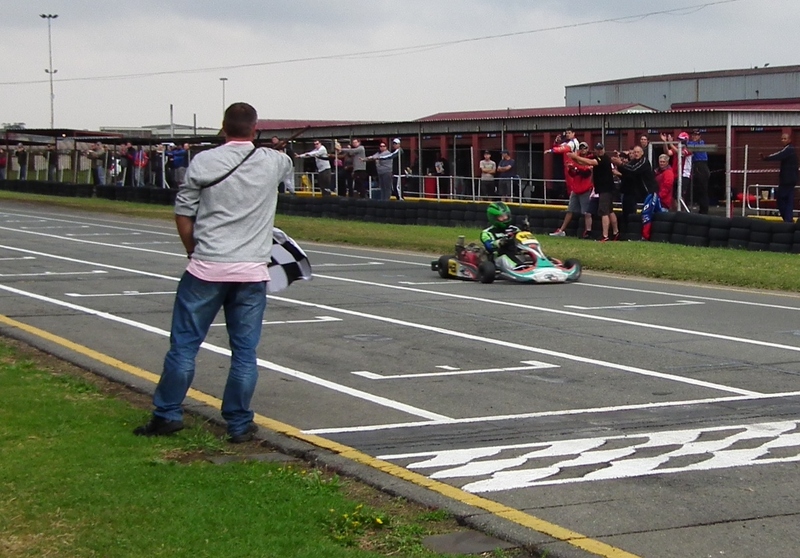 Unfortunately very little, because without doubt they had the best prepared kart, kept it on the black stuff admirably, were quick when it mattered and finally won with 13 laps to spare. It was bit like watching a Formula 1 production. Mercedes disappear into the distance and the TV focuses on the also rans. Congratulations. Well done Southbank #43, a deserved win. Finally a great big thank you to the marshaling team, the CoC, timekeeper, scrutineer, kitchen staff, bar tender et al, without whom we could never stage this event as successfully as we have. These people stayed up all night making sure we were safe, fed and hydrated. Thank you!!! And so we are still counting the donations and sponsorships, as after all the REAL WINNERS will be those less fortunate than ourselves.